Bridgnorth Golf Club has a very active Seniors Men's Section and which is open to any male member who is over 55 years of age (or will be during the playing season) and who wishes to enjoy friendly and competitive golf with other like-minded gentlemen. To establish a framework for Senior men to compete and enjoy golf in a spirit of friendliness and fair play. To uphold the values of respect, integrity, courtesy, inclusion and sociability. To promote the interests of the Senior Men's section to the Management Committee. To promote Bridgnorth Golf Club to senior members of other golf clubs. To encourage the Junior Section in their love of the game and in the spirit and values of golf. To organise tournaments and matches for the enjoyment of all senior male members and to generate income for the club. There are a number of club competitions for Senior Men: The Veterans Cup in June and the Day Trophy in August. 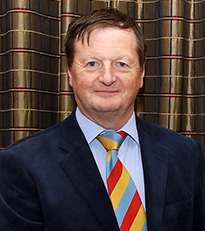 In addition a Singles Matchplay knock-out competition is played throughout the summer for the prestigious Frank Armstrong Cup and which is presented at the Christmas lunch. A new competition was introduced in 2015 in respect of our 2014 Seniors Captain, Bob Fielding, and who we sadly lost during his Captaincy year; this is an individual stableford competition, played from the yellow tees, with full handicap allowance and is open to all Bridgnorth Club Senior Men with the winner receiving The Bob Fielding Memorial Trophy and which was kindly donated by Bob's wife, Jane. The Senior men also play in Mixed competitions: The Rolling Pin in July against the Ladies; The Sidaway Cup in September where a Senior Man plays with a Lady partner and The Purnell Trophy in August where the Senior men play in pairs with the Juniors. Players get together on an informal basis in common with all Club members but also regularly play together as Seniors on a Tuesday and Thursday. A Senior men's medal is scheduled for the last Tuesday of each month and is a Stableford format from the yellow tees and qualifies for handicap purposes. A sweep and a twos competition is also run via the Pro shop just to give that extra excitement for the day! The best average 3 scores over the year are carried forward towards the Senior Men's Eclectic Cup as well as a Wooden Trophy for the runner-up and are presented at the annual Christmas lunch. One of the highlights of the Seniors calendar is the Friendly Fixture list in which Seniors participate in matches against other local clubs, around 27 matches in total during the Spring/Summer period. The format is friendly in that the competitions are in four-ball betterball format, with full handicap allowance and play being from the yellow tees. The matches are followed by a meal and the day is truly enjoyed by all. It is customary for the host club to buy the drinks, which is reciprocated on the return visit. Clubs participating in these Friendly matches receive courtesy of the course when playing in away matches; all in all a great day out for everyone. If you are 55 or more male and would like to play at the golf courses listed below at no green fee, just sign up to play on the Seniors notice board, which is located in the corridor, just outside the Mens Changing Room. The clubs participating in our home and away matches include: Brocton Hall, Droitwich, Perton Park, The Shropshire, Penn, Enville, Lilleshall Hall, Ludlow, Patshull Park, Shifnal, South Staffs, Worfield and Wrekin. 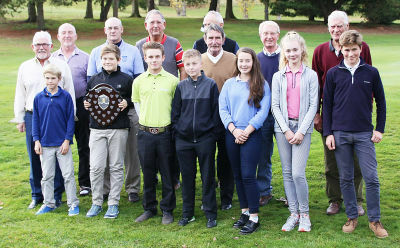 Additionally a special annual competition is held, 'The Centenary Bowl' and which is played between Bridgnorth, Minchinhampton and Stinchcombe Hill, with each club taking it in turns to host the competition. Men over 55 can represent the Club in 'The Ken Smith Trophy'. This is a SHUGC competition played during the autumn and winter. A team of six players compete in a scratch four ball better ball against opposing clubs. Low handicap players are encouraged to contact Hugh McNeill on 01746 766138. Whilst Seniors have always played together on a daily/weekly basis, the organisation of annual competitions and Inter-Club Friendly matches, have been coordinated over the past twenty years by Senior Organisers, who were Bryan Davies then Alan Lawrence followed by John James. In 2012 the club agreed to allow the Seniors Section to elect a Seniors Captain and Vice Captain. 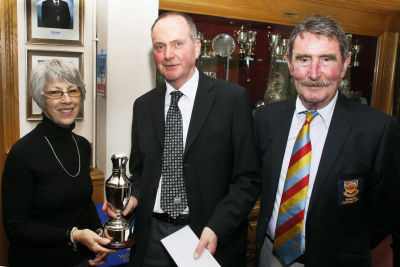 After being Seniors Organiser for 13 years John James was elected as the 2012 Seniors Captain. Following on are Mike Purnell (2013), Bob Fielding (2014 Part), Charles Dawson (2014 Part), Dave Fenwick (2015), Barry Holmyard (2016), Ernie Jarman (2017), Robert Baker (2018) and Charles Stadnick (2019). The Seniors Section is indebted to all the above members. There are four Senior Men's Opens, which are run annually. Senior Men's Singles Open (The Duke Trophy) played in May. Senior Men's Pairs Open held in July. Senior Men's Pairs Open held in September. Gents Senior Pairs Open Greensomes in October, with 3 age groups, similar to the Duke Trophy. All past senior competitions have been well supported by Bridgnorth players as well as from visiting clubs. These Opens are usually very well subscribed. We have a Facebook page for the Seniors! Please look and Like the page for Seniors announcements, news, fixtures and results, etc. We also have a Flickr page for the Seniors! For all the latest photographs, etc.